Andrews McMeel Publishing. Fine in Fine dust jacket. 1992. Hardcover. 0836246020 . Very slight shelf wear to DJ back. Clean and unmarked. 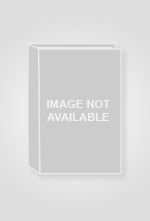 ; Main Street Editions Gift Books; 32 pages . Contemporary Books. Fine with no dust jacket. 1996. Softcover. 0809234300 . Uncreased spine. Clean and unmarked. Signed by authors. ; 163 pages; Signed by Author . Whitman 1947, 1947. 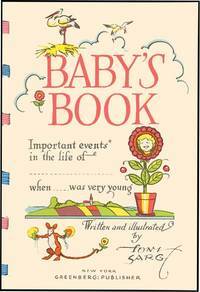 Baby's Own Story Year by Year, designed by Cecile Lamb, published by Whitman-latest copyright date shown is 1947. Hardback baby book has a gift inscription inside front cover- otherwise unused. Very cute illustrations-good to very good condition. No dj.. Hard Cover. Good to very Good/No Jacket. 1941. 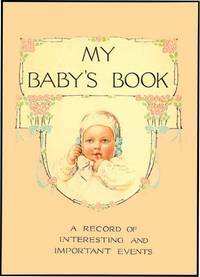 My Infancy (Biography of Our Baby from Birth to Seven Years) copyright 1941 by C. Junceau. Hardback baby book is unused and has a padded pink decorated brocade binding. Binding shows a little wear to corners and has a large stain on back-interior like new..
small black: Central Books Ltd, 1975. Paperback. Good. HARDBACK Condition good. ref ZKVQ Publisher: Foreign Language Publishing Group Moscow. Kaplan, A. O. & Frances Brundage. New York: Brentano's, 1891. Hardback 10" x 8.25". 69pp. Beige, red and black illustrated cloth, gilt lettering, all edges gilt. Mild soiling, else near fine condition; a quite bright copy. With much of Baby's data neatly filled in the blanks. This book is also interesting in that it features a phrenological chart at the back, with lists of faculties, remarks on the 'science', and an illustration of a head and its various sections. The phrenological section's fields are not filled in. Frances Brundage provided charming illustrations throughout. She was among the most highly regarded and successful illustrators of her era. Baby Days. Our Baby's History. New York: E.P. Dutton & Co., 1891. Hardback 10" x 8.75". 62pp. Cream cloth, gilt lettering, all edges gilt. Mild soiling, else near fine condition; a nice copy. None of the data fields in the book are filled in. With charming illustrations throughout by Ida Waugh, Eddie J. Andrews and Harriet M. Bennett. With six full page chromolithograph plates. SMITH, JESSIE WILLCOX. (SMITH,JESSIE WILLCOX)illus. 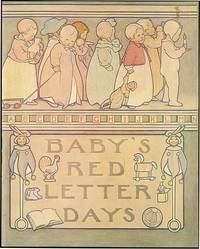 BABY'S RED LETTER DAYS. Syracuse: Just Foods (1902). 8vo, (6x7 1/2") stiff embossed pictorial tan wraps, silk tie, many entries Fine. Illus. with beautiful embossed pict. cover, pict. ep's in orange plus 5 full page color (tints), many half page color and numerous text decorations as well. This is a beautiful copy of a scarce Smith item. Nudelman A14. Early, not 1st. McCULLOUGH, WAVA A.. ABC. 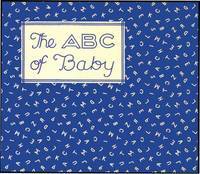 (BABY BOOK) ABC OF BABY: Baby's Record from A to Z verses by Josephine Lee Randall. Chic. : Reilly & Lee (1927). Oblong 8vo, (9 x 6 3/4"), gilt cloth, AS NEW IN PUBLISHER'S BOX (box sl. worn). This baby book has room for photos and the "firsts" of baby arranged alphabetically. "A" is for Baby's Arrival, "B" is for Baby's Birthplace. Designed and illustrated in b&w by Wava McCullough. Great copy. LEE, EDNA DOLBEAR. VOLLAND. MY BABY'S BOOK. Chic. : Volland (1915). 8vo, blue silk binding, some entries and sl. wear to edges else VG. Illustrated in color by Edna Dolbear Lee with decorations by Ella Brison. Rare Volland book. KREBBIEL, DULAH EVANS. 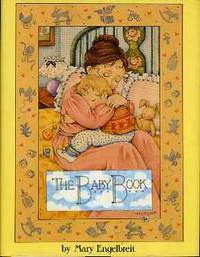 BABY BOOK. BABY'S CHILDHOOD DAYS: A BIOGRAPHY. Chic. : Reilly & Britton ca 1908. 8vo, gilt boards, beveled edges, all edges gilt, light cover soil, VG+ and unused. Illus. by Dulah Evans Krebbiel with charming full color illustrations on every page, somewhat in the style of early Charles Robinson. 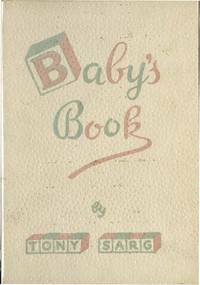 A rare and lovely baby book. SARG, TONY. (SARG,TONY)illus. BABY'S BOOK. NY: Greenberg (1943). 4to (7 x 10"), white spiral backed boards, slightest bit of cover soil else Fine and unused. Written by Sarg and illustrated by him with color endpapers and color illustrations on every page of text (printed on one side only). 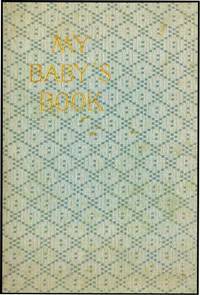 A wonderful baby book in excellent condition and a rare Sarg item. LEE, EDNA DOLBEAR. VOLLAND. MY BABY'S BOOK. Chic. : Volland (1915). 8vo, pictorial boards, sl. edge rubbing else fine and unused. Illustrated in color by Edna Dolbear Lee with decorations by Ella Brison. Rare Volland book. SMITH, JESSIE WILLCOX. (SMITH,JESSIE WILLCOX)illus. BABY'S RED LETTER DAYS. Syracuse: Just Foods (1901). 8vo, (6x7 1/2") stiff embossed pictorial tan wraps, silk tie, slightest of cover soil else Fine and unused. Illus. with beautiful embossed pictorial cover, pictorial endpaper in orange plus 5 full page color (tints) illustrations, many half page color illustrations and numerous text decorations as well. This is a beautiful copy of a scarce Smith item. Laid-in is the original height-weight chart that came with the book - printed on outside with testamonials. Nudelman A14. 1st ed and first and only appearance of these illustrations. SARG, TONY. (SARG,TONY)illus. 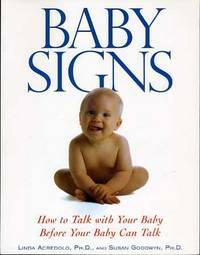 BABY'S BOOK. NY:Greenberg (1943). 4to, (7 x 10"), spiral backed white pictorial boards, As New and unused in original plain box (part of one flap off). 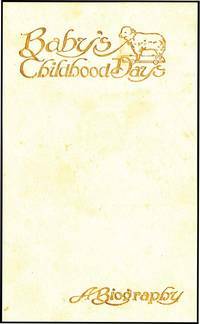 Written by Sarg and illustrated by him with color pictorial endpapers and color illustrations on every page of text (printed on one side only). 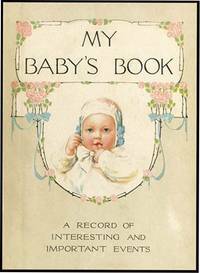 A wonderful baby book in excellent condition and a scarce Sarg item. LEE, EDNA DOLBEAR. VOLLAND. MY BABY'S BOOK. Chic. : Volland (1915). 8vo, blue gingham cloth, UNUSED AND FINE IN DUST WRAPPER AND BOX! Illustrated in color by Edna Dolbear Lee with decorations by Ella Brison. Rare Volland book. MARSH, LUCILLE PATTERSON. BABY BOOK. 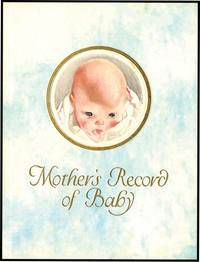 MOTHER'S RECORD OF BABY from birth to five years of age compiled by Mary Clarke Colquhoun. Joliet: Volland (1923 10th ed). 4to, boards, pict. paste-on, AS NEW AND UNUSED IN GLASSINE! Illustrated in typical Volland style by LUCILLE PATTERSON MARSH in the style of Fannie Cory with beautiful color illustrations throughout. Rare. ANDERSON, ANNE. (ANDERSON,ANNE)illus. BABY'S RECORD. London: George Harrap (1920, 1928). 4to (8 x 10 5/8"), pink moire stamped in gold and blue, top edge gilt, 63p., a few entries erased else FINE IN PUBLISHER'S PICTORIAL BOX! Issued in a deluxe leather edition in 1920, this is most likely the first cloth edition. 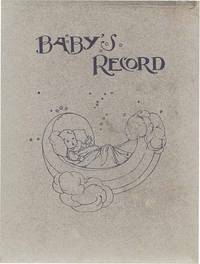 A book to record baby's firsts with text composed of poems by George Macdonald, William Blake and other notables. Illustrated by Anderson with 6 beautiful color plates and delicate and lovely line illustrations in text. This is a superb copy of a rare Anne Anderson book. HUMPHREY, MAUD. 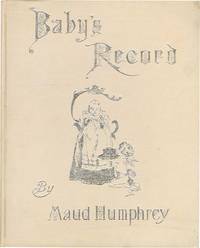 (HUMPHREY,MAUD)illus. BABY'S RECORD. NY: Frederick Stokes 1898. 4to (9 x 11"), white cloth pictorially stamped in silver, very faint mark on cover and a few insignificant erasure marks, a Very Fine copy in the ORIGINAL PUBLISHER'S BOX with printed label (box has soil and flap repairs). First edition of this most desired baby book. Featuring 12 absolutely lovely chromolithographed plates plus 30 illustrations done in shades of green. Printed on heavy, good quality paper on one side of the page only. Later printings reduce the number of chromos. This is a remarkable copy, rare in the box.